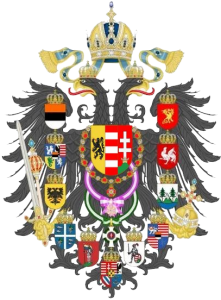 The Emperor-King of Karnia-Ruthenia is a hereditary imperial and royal title and position proclaimed in 2016 by Oscar I, a member of the House of Götzö-Thomaz-Rocha. The emperor-kings retained the title of Archduke of Karnia after their ascension to the Throne. The wives of the emperors-kings bore the title of empress-queen, while other members of the family the title archduke or archduchess of Karnia and prince or princesses of Ruthenia. On 02 February 2016, the Empire of Karnia was founded. From there to the present day, there were two emperors of two separate ruling families. The first Emperor of Karnia was Anton Wenzel, founder of Karnia, who ruled from its foundation until 10 March 2016, when he abdicated the throne in his name and his descendants. His successor is the King of Ruthenia, Oscar of Goëtzën-Thomaz-Rocha. Karnia was founded to be a tribute to the Monarchy of the Habsburgs, and everything in Karnia in fact, refers to it. The title of Emperor is originally “Kaiser” and the titles of other family members be “Archduke” or “Archduchess” are part of a tradition that incorporated new dynasty, and that led to the Karno-Ruthenian Monarchy. The history of the Ruthenian Monarchy, however, is less recent. On 19 November 2014, after gaining permission from his father, the now Archduke Ari of Karnia, King Oscar of Ruthenia established the Throne of Ruthenia, declaring Ruthenia to be an independent kingdom. The Archduke Ari was the first King of Ruthenia and was succeeded by his son the day after the foundation of the Kingdom. After a moderately troubled beginning, the House of Ruthenia acquired fame and respectability, and over the years ascended to thrones and other joining Ruthenia in several personal unions. One of those micronations who made a vote of confidence to Ruthenia and joined his project under the leadership of Oscar I was the Empire of Karnia. With many problems to establish a functioning government, a constitution, and especially in achieving recognition of other micronations, they realized a micronational project was much more difficult to drive than they would have imagined. When the Kingdom of Ruthenia offered the necessary help, they accepted enthusiastically, but the cost of this intervention to save the newly created project was to deliver the Imperial Crown to the King of the Ruthenians. In return, the project would be expanded and be at par with the Kingdom of Ruthenia. The result of this negotiation was the Karno-Ruthenian Compromise of 2016, that created a common monarchy between the two micronations. The Imperial Constitution kept many rights already exercised by the King of Ruthenia, although as Emperor-King, now he had the Supreme Moderator Power, and not the Supreme Administrative Power, usual for the Ruthenian monarchy. The Emperor-King must represent the Empire abroad, as well as to moderate the Imperial and Royal Government. The Emperor-King is the Head of State and also the cerimonial head of the foreign nations, being able to intervene in the government, make a declaration of war and conclude peace as Commander-in-Chief of the Imperial and Royal Armed Forces.